.... There was an amazing toy called Lego, a toy that couldn't be trumped by any other toy company no matter how hard they tried. Lego is the most versatile toy out there and if your a regular reader of the blog then you'll know exactly what I mean (I'm holding on to a big chunk of Lego as I type this). 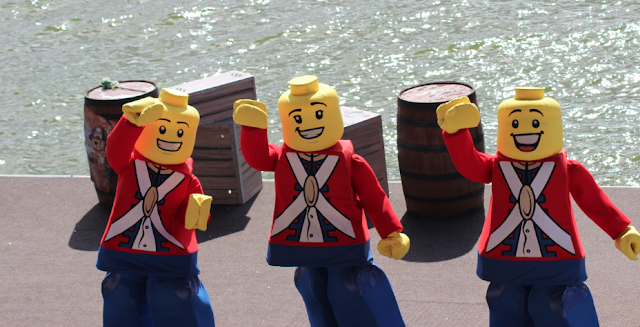 Being such a fan and thanks to Visit Orlando a trip to Legoland Florida was obviously on the cards during our holiday. We had tried to go a few days before this visit but were surprised to find the park closed so be sure to check opening times as Legoland is a lot further out than any of the other attractions (no where else here seems to close though?). Dont be put off though the farmland and Orange groves make for a very relaxing and scenic journey. Anyway wasted journey aside as soon as the park was open again we made our way over. It was good to see that there wasn't thousands of people queuing to get into the park and the carpark was nowhere near as full (this maybe why the park is closed two days a week though). *parking charges apply as with all of the parks. Legoland was a lot quieter than the other parks which was great as it meant we could pretty much walk straight on to all of the rides (I hate queuing!). The park is pretty big and takes a fair amount of time to get around it all. The buildings as you would expect are truly amazing and I was so impressed, they put my builds to shame (although I have been getting some great comments about my Aquaman iphone case while here). We spent sometime looking round American States, New york, Las Vegas etc and famous land marks like Kennedy space centre. The boys then buckled up and took their Lego driving tests which looked like fun, I saw Seth mount the curb but he styled it out and still got his Lego license, shhhhh....! After going on a few of the rides we headed towards the Lego pirates section of the park to watch the Lego Pirate show. We sat in the seated area around a huge lake that Legoland is on and if I'm honest i wasn't expecting much. It started off a little slow but then BAM! Lego minifigures on water ski's!!! Amazing!!! After the show we got to meet some of the cast which the boys loved. And then it was off to find more rides but not before stopping for a picture with Batman and Robin first. I was really disappointed that there wasn't more Lego Batman or any Lego Marvel with both the Lego Kit ranges and Video games being so huge at the moment. A Lego Gotham city area would have been amazing. Everyone had fun on the rides, although Seth managed to talk Mrs M in to going on one of the bigger rollercoasters and she didn't look best pleased when she walked off, apparently she just closed her eyes tight and held on to her 7 year old son hahaha. The tropical plants were really lovely and the gardens were so relaxing, even the wild alligators couldn't stress us out. It felt like you were a million miles away from a theme park which was what made it so great, it was a lovely hour or so break from the noise of roller coasters and excited children tanked up on fizzy drinks, i would pay the entrance price just to walk around there. When we came round full circle it was back to the rides, Seth seems to have gone roller coaster mad so he couldn't wait to go searching for his next ride. We made our way over to the Lego kingdoms section of the park, some of the Lego animals along the way were unbelievable it really makes me wish i had more Lego because i know that i could build like this given the proper resources. Seth loved the Lego castle and knights and Mrs M got dragged on to another roller coaster while me and Mini me had a look around the Lego Chima section of the park. I'm not a big fan of the Lego Chima range but Opeie looked very excited and was happy to meet one of the characters. It was getting close to the park closing time which is 5pm, again i was a little surprised at this as i think many people would be happy to spend a lot longer there and considering some of the bigger parks are still open till gone 11pm it made me wonder why Legoland had closed the water park, was closed for two days in the week and closed early evening? It was a shame as i think with Lego being such a huge company with their amazing products and the themes such as DC, Marvel, Spongebob and many others they could have done so much more. I was expecting to see a haunted house from the Monster Fighters range which is my favourite of their recent ranges but sadly there was nothing from this range apart from the kits being sold in the gift shops. Mrs M and the boys managed to squeeze in one last ride as we were on our way out. I loved watching them all look so happy each time they passed me. And before leaving we nipped in to one of the gift shops to buy some things i had spotted when we arrived. The shop assistant Yamelis made my day, she was so kind and friendly to the boys and gave them both a Minifigure. I was blown away by the headband that she had made to celebrate Thanksgiving which was just around the corner. A really fun use of the bricks and it put a big smile on my face, I love fun creative Lego ideas. Although i was a little disappointed by the park it was a really great day out with my three favourite people. The boys had a great time which wasn't really surprising because they love anything Lego. Seth said that Legoland Florida was much better than Legoland Winsdor which I'm yet to go to so if we go there in the future it will be interesting to compare the two. It would also be nice to see if there is any difference in the park during peak time but extra queuing and busyness could also be a put off so its swings and roundabouts really. If you are a huge Lego fan then its worth checking out just for the creations and you can be sure that younger children will be more than excited with a visit there. P.s Forgot to mention how much i loved the giant Albert Einstein Lego sculpture, amazing!